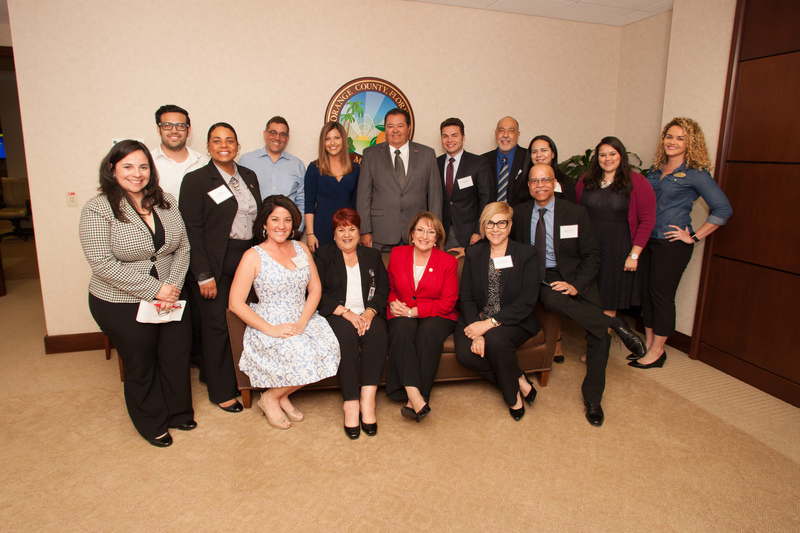 Mayor Teresa Jacobs met with Hispanic media outlets to discuss how Orange County serves the Hispanic population. Orange County Mayor Teresa Jacobs recently met with several local Hispanic media outlets and reporters of Latin American descent to expand outreach into multicultural communities and to showcase the services that Orange County provides to citizens. Newly-appointed Special Assistant to the Mayor Millie Irizarry, from the Office of Public Engagement & Hispanic Affairs, assisted in coordinating the event with the County’s Communications Division. Irizarry said the goal of the lunch and learn was to showcase current Hispanic outreach efforts and highlight initiatives that serve Hispanic constituents. Individuals representing El Sentinel, WFTV, WESH, El Sol de la Florida, WOFL, El Osceola Star, the Hispanic Chamber of Commerce of Metro Orlando and Hispanic Speak Out TV participated in the lunch and learn. Guillermo Hansen, editor of El Osceola Star and member of the Board of Trustees at Valencia College, said he was honored to be included in the conversation. Mayor Jacobs and Orange County’s Board of County Commissioners (BCC) have continuously supported the region’s Hispanic communities, small businesses and entrepreneurs. As of 2011, one out of five businesses in the Orlando area is Hispanic-owned and approximately 30 percent of Orange County’s population is of Hispanic heritage. In recognition of this economic impact, the BCC allocated $125,941 to the Hispanic Business Initiative Fund (HBIF) in FY 2014-15 and $128,460 in FY 2015-16. HBIF is a nonprofit economic development organization that serves Orange County’s Hispanic business owners by providing quality bilingual business development and training services to help strengthen their business and Florida’s economy. Center and the atrium of the Orange County Government Administration Center throughout the duration of Hispanic Heritage Month. In October, the County hosted its third annual Orange Fiesta in the Park, a family-friendly event hosted by Orange County and the Hispanic Heritage Committee of Greater Orange County (HHCOGOC) celebrating Hispanic Heritage Month. HHCOGOC was founded in 1999 with the purpose of providing opportunities that promote and highlight the contributions made by individuals of Hispanic descent in the community. The County is also a longtime supporter of Hispanic Chamber of Commerce of Metro Orlando and its mission, which is to provide leadership and to support the economic development of Hispanic businesses and entrepreneurs in Central Florida. Photos from the lunch and learn are available on Mayor Jacobs’ Flickr album.